Your baby needs to be reminded through their whole life the sacrifices you’ve made for them. How can you give them a permanent reminder of how much they should love you? 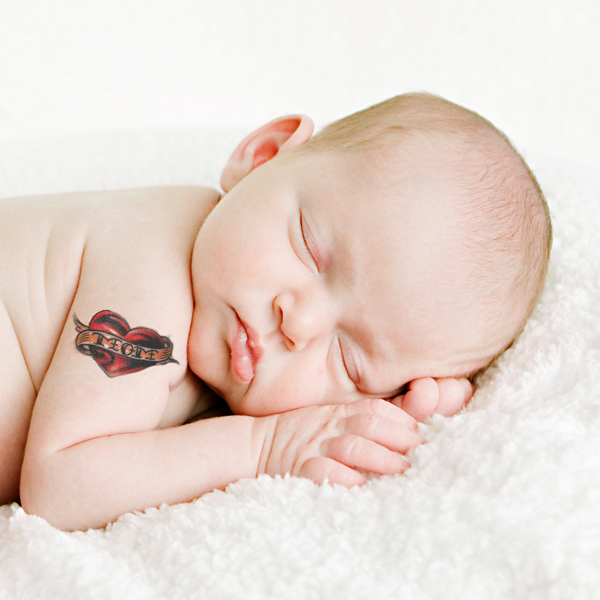 Baby tattoos! Your child is either sleeping or crying all the time. What’s the difference if she’s getting a tattoo? Baby skin is stretchy. The tattoo will grow with her, as will her love and adoration for you for giving her such a great lifelong gift of art. She’ll be the baddest baby on the block; nobody’s gonna bully this kid! She has a TATTOO for crying out loud! So don’t just give your baby the gift of life, give her the lifelong gift of your name on her body. This entry was posted in Beauty, Fashion, Tattoos and tagged baby ink, baby tattoo, tattoo. Bookmark the permalink.